During our MK Kenya retreat, we studied and discussed the book of Nehemiah, focusing on the first 6 chapters. I'm going to share our study over 2 blog posts. Part 1 is chapters 1-2; part 2 is chapters 3-6. Nehemiah is one of my favorite people in the Bible. When he saw a need that broke his heart, he was moved to compassion, he prayed, and he did something about it. Nehemiah was in Susa, Persia. The first group of exiles had returned to Jerusalem 90 years earlier. Seventy years earlier, King Cyrus had commissioned the rebuilding of the Temple, as Isaiah prophesied. Nehemiah worked for King Artaxerxes I. He was a cupbearer and advisor. When Nehemiah’s brother returned from Jerusalem, Nehemiah found out that the Temple was the only thing that had been rebuilt. These 70 years the rest of the city remained in ruins, without so much as a wall of protection around it. Nehemiah was heartbroken, moved to compassion. He mourned, fasted, and prayed for days. Finally he prayed that God would give him success in asking the king to let him go to Jerusalem. I imagine he didn’t immediately think that he would be the one to rebuild the wall. This is totally my own projection, but if he was anything like other humans, Nehemiah probably started by praying for God to do something about this. When God led Nehemiah’s heart to want to be part of the solution, he responded willingly. He didn’t go into his prayer under the assumption that praying was all he was willing to do. Prayer is a central theme in the book of Nehemiah and apparently was an important part of his life. Sometimes he writes out his prayers in the book, and other times he simply mentions that he prayed as he went about activities or conversations. His lifestyle of prayer was vital to his relationship with God. When we pray faithfully, our will becomes aligned with God's. This gives us the willingness and even the desire to be part of the answer to our prayers. Five months passed. The king noticed Nehemiah was upset and asked him what was troubling him. He had the power to have Nehemiah executed simply for appearing upset in his presence, but he didn’t. God had answered Nehemiah’s prayer. He found favor with the king. 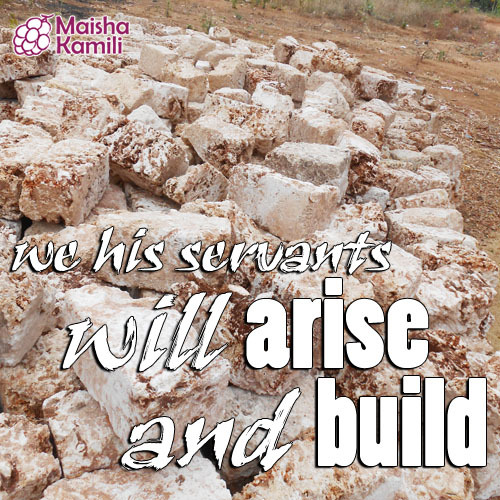 Praying as he spoke, Nehemiah explained to the king his burden for Jerusalem and his desire to rebuild the wall. The king not only agreed, but provided for the project. Once in Jerusalem, Nehemiah surveyed the ruins by night and made his plans alone before sharing with the leaders. The leaders agreed to join the project. Have you heard any reports that you need to petition God about? What will you do to become part of the answer for that prayer?